However, it is unclear whether all of the senators who voted in favor of the spending bill were aware of all the provisions after a series of last-minute amendments were added to it. The measure was not initially drafted to include funding for a stadium, according to Jake Kramer, a legislative aide to one of the bill’s primary sponsors, Sen. Michael Skindell, D-LakeWood. But the bill became a "Christmas Tree Bill," which is "a rather uncontroversial bill that has dozens of amendments that weren’t necessarily germane to the original intent added on to it," Kramer said. The soccer stadium subsidy was one of the amendments and it was added by the House Finance Committee on Dec. 11, which was one day before the bill was passed by the House and two days before the bill was passed by the Senate. The final amended bill passed the House 66-21 and was then approved by the Senate 29-2. It will now go to Republican Gov. John Kasich for his signature or veto. The other primary sponsor of the legislation, Sen. John Eklund, R-Munson, did not seem to be aware that funding for a soccer stadium was added into the bill through an amendment, despite voting for the amended bill. In a phone call with Watchdog.org, Eklund said that – how he understood the bill – money was not going directly to fund the stadium, but was instead being used only for redevelopment of the surrounding area, including office space and residential units. 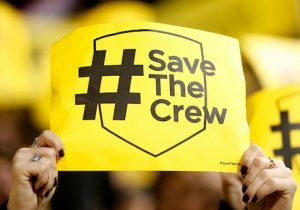 However, Amendment 3465 in the bill earmarks $15 million for "Columbus Crew SC Stadium capital appropriation." Eklund said the bill’s redevelopment appropriations would generate more than a thousand new jobs and would increase the tax revenue for the state and the paychecks of the people living in the Columbus area. John Fortney, a spokesperson for the Ohio Senate Republicans, told Watchdog.org that the state funding for the soccer stadium is only a small portion of the project. "The funding request is well within other sports-related community development projects that were funded in the past, including for Cincinnati and Cleveland," Fortney said. "This request is a small part of a $230 million project that is designed to be much more than a stadium. It also concentrates on community improvements by turning the current location into a multi-purpose community sports complex and park, which will help improve the neighborhoods surrounding it." Although the measure received broad bipartisan support in both chambers of the legislature, not everyone thought that funding a sports stadium was a good idea. Greg Lawson, a research fellow for the Ohio-based, free-market Buckeye Institute told Watchdog.org that funding sports stadiums is not a proper role of the government. Citing a Mercatus Center study, Lawson said that stadium subsidies rarely achieve the goals that are promised by their supporters. The study found that there is little evidence to suggest that sports-initiated development leads to more economic wealth, but rather that using taxpayer money to fund these initiatives is more likely to reduce economic growth in the long run. On top of that, sports teams generally have the funds to pay for these stadiums privately, he said. "While [corporate welfare] is a problem in pretty much every state, Ohio has a particularly strong tendency to view corporate welfare as an economic development tool," Lawson said. "Most policymakers don't fully appreciate the problem. All too often, they see ribbon cutting ceremonies and initial claims of job creation as a good thing." "But they do not consider the jobs that are never created because of higher taxes," he added. "After all, each business that doesn't get a special tax break or subsidy has to pay more than their fair share to make up for the lost revenues diverted from core government services as tax dollars are lavished on specific projects."